Line the tops of hard-to-reach cabinets with paper grocery bags so instead of dusting, you can just replace the bags. 1. Stick empty gift wrap rolls on the end of your vacuum hose to reach new heights. Finally, an easy way to clean those high ceiling corners. See it here. 2. 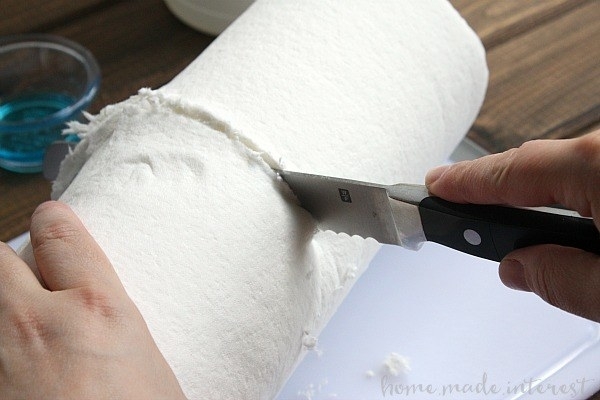 Cut a paper towel roll in half and soak it in cleaning solution to make cheap AF cleaning wipes. Cleaning wipes are so helpful, but so expensive. Pour a mix of vinegar, water, and dish soap over the towels and remove the cardboard. 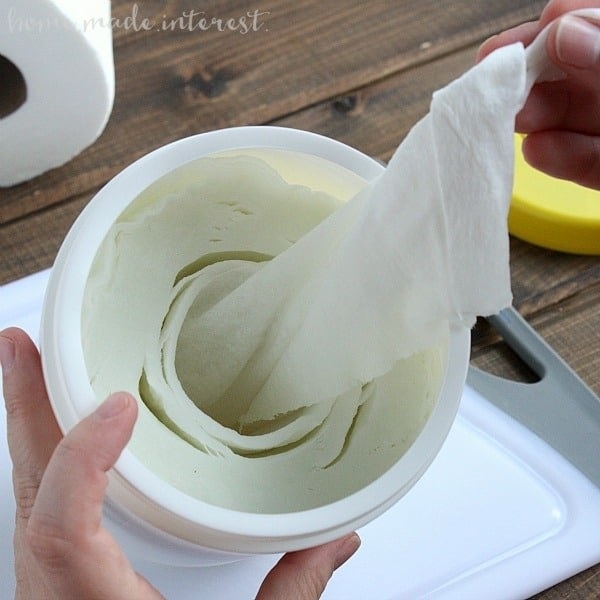 Add essential oils to make the wipes scented! Pull a sheet through the cleaning wipe dispenser and you won't know the difference. See it here. 3. Wrap microfiber towels around salad tongs to easily dust your blinds. Use rubber bands to hold the towels in place and tightly clasp the tongs on the blinds as you pull them back and forth. See it here. 4. Cut down on clutter by storing spare cords in toilet paper rolls. Just wrap the cords and push them through the roll! Write what they charge or plug into on the roll so you don't forget which is which. See it here. 5. Use a lint roller to pick up tiny messes like sprinkles, crumbs, or broken glass. You can also use a lint roller to pull some of the loose dirt off window screens and dust lampshades. See it here. 6. Connect your soap dispenser to a giant bottle of soap with clear tubing so you don't need to refill it as regularly. Unscrew the handle and toss the plastic canister that used to hold the soap. Wedge the tube onto the dispenser's straw and snake it under the sink and into the soap bottle. That's it! See it here. 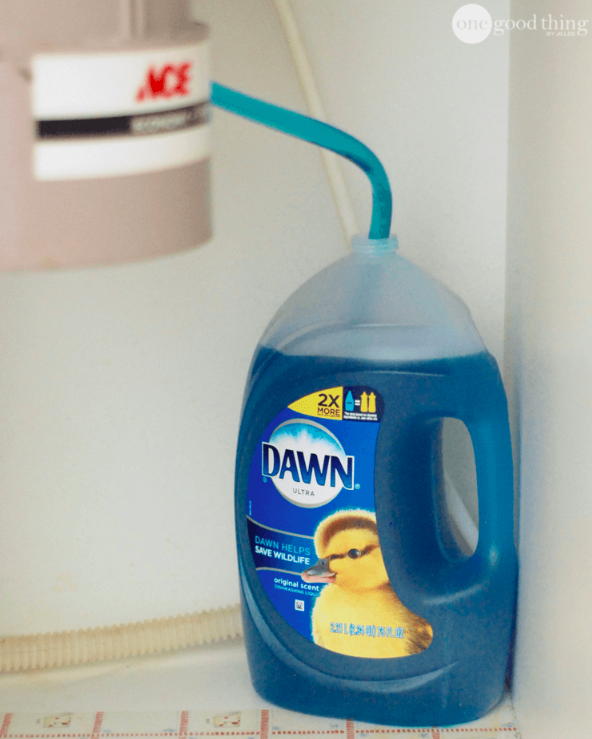 Get two 56-oz bottles of Dawn on Amazon for $11.68. Get the tubing from Amazon for $26.99. 7. Line the drawers and shelves inside your fridge with vinyl placemats to make cleaning so much easier. Instead of scrubbing the stuck-on food off every single shelf, you can just pull out the placemat, which is way more stain-resistant and easier to clean. See it here. 8. Use wire cutters to snip tiny cuts on either side of a zip tie, and push them down to make barbs that pull hair out of the drain. Use wire cutters to make tiny cuts on either side of the zip tie, and pull the snipped parts away to make the barbs. Then stick it down the drain and pull out your worst nightmare! See it here. 9. Keep all your hair ties together with a carabiner clip. You can either hang the carabiner, or stow it in a drawer. Either way, you've still got them all in one place! See it here. Get a five-pack of carabiners from Amazon for $6.59. 10. Soak a grimy pan with warm water, dish soap, and a dryer sheet for an hour to make it sparkle. 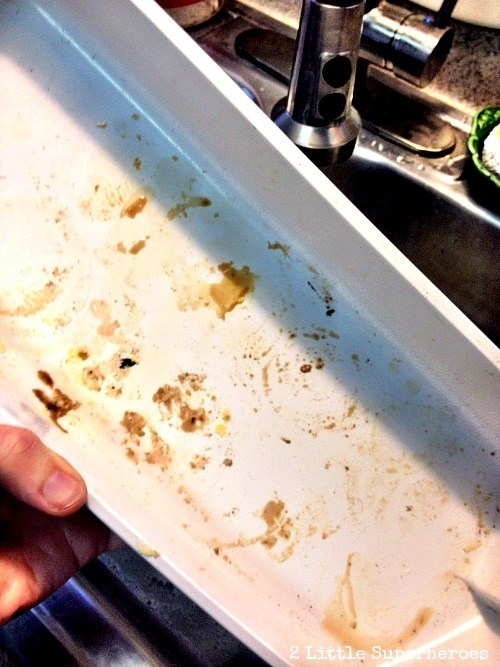 After letting it all soak for an hour, remove the dryer sheet and wipe the pan (without emptying the water!) with a sponge. Give it a rinse and the stains should be gone! See it here. 11. Stick plastic wrap or aluminum foil on hooks to easily make a one-handed tear. So much easier than finagling with those terrible boxes. It's a space-saver too! See it here. 12. Lay a reusable oven liner across the bottom rack so you're not scrubbing at baked-on food the next time you clean the interior. Just give it a rinse whenever food drips! You'll be saving yourself a huge hassle in the long run. 13. Cut tangled hair out of your vacuum's roller brush with a seam ripper. Just slice the seam ripper through the hair and then pull it out with your hands. See it here. 14. Lay paper bags across the tops of your kitchen cabinets so dusting is as simple as changing them out for new ones. First, clean the cabinets with white vinegar. Then, cut up grocery bags to fit the sections and lay them down. That's it! See it here. 15. Stack file holders to make a few extra shelves in the fridge or freezer. You can also keep them upright in the pantry to take advantage of vertical space. See it here. 16. Store cereal and grains in empty juice bottles to carefully pour just the right amount and keep everything fresh. Stick chalkboard labels on the front and cooking instructions on the back. See it here. 17. Hang a mesh shoe organizer in your shower if there are simply too many products for the bath ledge. If you have a plastic shoe organizer, just poke holes in the bottom of each pocket so the water can drain! See it here. 18. Use a broom to clean the tub so you don't need to literally get in to give it a good scrub. The bristles will help agitate the soap and break up mildew and soap scum. 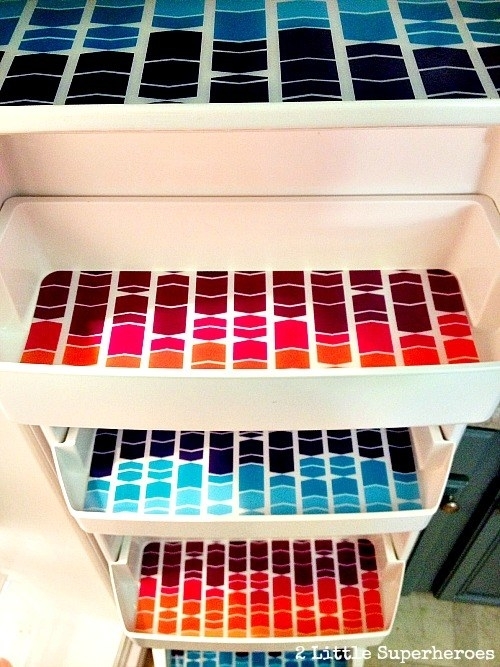 You can also use it on the walls and ceilings! See it here. 19. Use command hooks to keep garbage bags from falling into the can. And drill a hole in the bottom of the can if the suction makes it difficult to pull the bag out. See it here. 20. Hang jeans from s-shaped hooks to save money on hangers and free up space. You can also use these hooks to hang bras, belts, and tank tops! See it here.